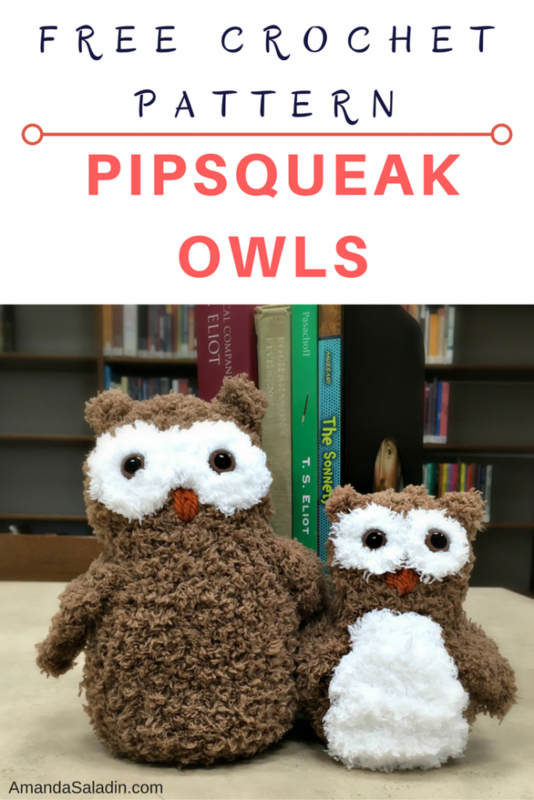 Pipsqueak Owls - Free Crochet Pattern - love. life. yarn. 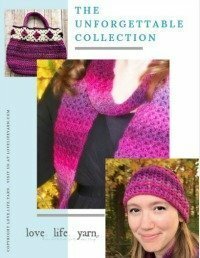 I have a confession to make – I am in love with this yarn!! I have been working on a series of stuffed animals and trying out different yarns and so far this is by far my favorite. I still have a couple more yarns I want to try out, but I definitely plan on getting more Bernat Pipsqueak yarn! I picked mine up at my local Joann in Chocolate and Whitey White and can’t wait to try out the other colors. I have already created these two owls and another animal and I am going to continue with an entire series of Pipsqueak Animals. I wish you could feel how soft and squishy these are. 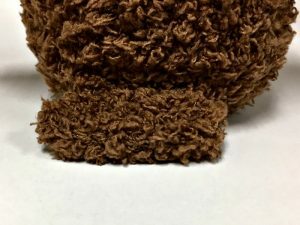 I took these to school to get a picture of them in the library and when my students saw them they couldn’t get over how soft they were – I even had several just want to hold them for the class time! I put rice in for the base to give them weight and help them sit up, then filled the rest with fiberfill. Add some safety eyes, embroider a beak and they are all ready to go! Yarn: Bernat Pipsqueak (100% Polyester, each 3.5oz/100g and 101 yds/90 meters): 1 ball each Chocolate (MC) and Whitey White (CC). Notes: Work each round without joining. Use stitch marker to keep track. Round 1: Work 6 sc in 2nd ch from hook – 6 sts. Round 2: Work 2 sc in each st – 12 sts. Round 3: *Sc, 2 sc in next st; repeat from * – 18 sts. Round 4: *Sc 2, 2 sc in next st; repeat from * – 24 sts. Round 5: *Sc 3, 2 sc in next st; repeat from * – 30 sts. Rounds 6-15: Sc in each st. Round 16: *Sc 3, sc2tog; repeat from * – 24 sts. Round 17: *Sc 2, sc2tog; repeat from * – 18 sts. Round 18: Sc in each st. Round 19: *Sc 2, 2 sc in next st; repeat from * – 24 sts. Rounds 20-22: Sc in each st. Round 23: *Sc 2, sc2tog; repeat from * – 18 sts. Round 24: *Sc, sc2tog; repeat from * – 12 sts. Fill with 1/2 cup rice, then stuff with fiberfill. Round 25: *Sc2tog; repeat from * – 6 sts. Round 26: Repeat round 25 – 3 sts. Fasten off, leaving a 6″ tail. Stuff head fully with fiberfill, then draw yarn through remaining 3 sts and draw tight to close. Round 2: Work 2 sc in each st – 12 sts. Fasten off. Attach safety eye to center of each eye patch. Sew eyes onto face. Use orange scrap yarn to embroider beak. Row 1: Sc in 2nd ch from hook; turn – 1 st.
Row 2: Ch 1, 2 sc in first st; turn – 2 sts. Row 3: Ch 1, 2 sc in each st; turn – 4 sts. Row 4: Ch 1, 2 sc in first st, sc 2, 2 sc in last st; turn – 6 sts. Rows 5-7: Ch 1, sc in each st; turn. Sew wings to sides of body as shown in photo. Row 1: Sc in 2nd ch from hook and next ch – 2 sts. Row 2: Sc2tog – 1 st.
Fasten off. Sew in place to top of head. Row 1: Sc in 2nd ch from hook and each ch across; turn – 4 sts. Row 2: Ch 1, 2 sc in first st, sc 2, 2 sc in last st; turn – 6 sts. Sew tail to body as shown in photo. How does the owls look so fuzzy? Love this pattern i just dont understand how they would look like that what yarn should be used? Thank you. Hi Michele! The fuzzy look is all because of the yarn. I used Bernat Pipsqueak and it is a really soft squishy yarn used for baby items and animals. Just look up Bernat Pipsqueak and you’ll see what I mean. 🙂 I picked mine up at my local Joann, so if you have any type of craft store nearby they probably carry it. 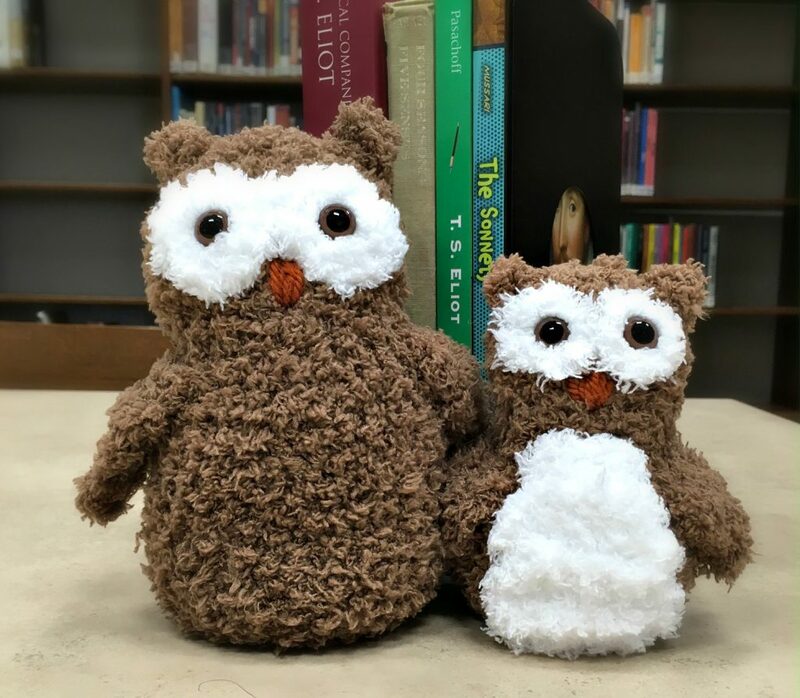 I am going to try to make these for my daughter she loves owls is there a pattern for the small one. Thanks for the free pattern. Love it! Glad to hear you like the pattern 🙂 I really enjoyed creating it! Soooo cute!! 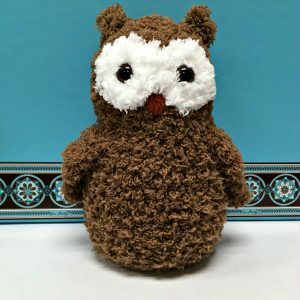 would like to make small owl,but cant seem to find the link. My Nana LOVES owls and I thought the Mama Owl and Baby Owl would be perfect gifts for her. Thank you for the pattern they are truly incredible.